will be through written exam and interview only. Engineering Degree B.E/B.Tech in Electrical or Electronics or any other related qualification having candidates are eligible to apply online for this APSPDCL Recruitment 2019. Official website to online form submission is www.apspdcl.in. AE Exam Pattern and Syllabus, qualification, how to apply online and other details of this APSPDCL Recruitment of Assistant Engineer Electrical Posts are updated below. 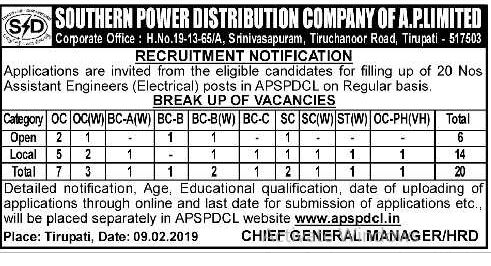 There are total 20 posts are in this AP Southern Power Distribution Company Ltd AE Electrical recruitment 2019. Upper age limit is 42 years for this APSPDCL AE Posts recruitment 2019. For SC/ST/BC candidates 47 years. Refer notification for complete details regarding age limits. B.E or B.Tech in Electrical or Electronics Engineering completed candidates are eligible to submit the online application form for this AE jobs in APSPDCL. Salary for this AE Jobs will be Group B level. An objective type written exam will be conducted for this APSPDCL recruitment of AE Posts. 100 marks exam will be conducted for this AE posts of APSPDCL. Candidates can apply online before the closing date through the official website of www.apspdcl.in. Written Exam date, hall ticket available date, exam result and other details regarding this AE Electrical posts is updated in this website only.